It's fun to research the lives of famous artists of the past. Eadweard Muybridge was a certified eccentric and in a sense more of a scientist than an artist yet his efforts resulted in a fundamental change in the direction of equine art. George Stubbs combined art and science, taking his findings in studies of the anatomy of the horse directly into his wonderful paintings of the animal. A more recent artist, Charles Russell, famed for his western themed paintings was an adventurer and storyteller as well. At the risk of name dropping I can, from our breakfast nook look over to the land in the Flathead where Russell spent many summertime days with a close friend. An artist of a slightly different stripe though a contemporary of Russells was Sir Alfred James Munnings (1878-1959), one of Englands finest painters of horses. A native of Suffolk, Munnings served as a printer's apprentice, while attending the Norwich School of Art. As a promising painter, Munnings devoted his efforts to rural scenes and, particularly, to horses. By the time he was in his early twenties several of his works had been on display in the Royal Academy. Sir Alfred lived the last 40 years of his life in Castle House, Essex. Castle house has been restored to past grandeur and today serves as a memorial to Munnings and his work. Munnings'greatest works are considered by many to have been painted in the first two decades of the twentieth century. Munnings was very much a student of the style of realism, very a[pparent in his depiction of scenes at the race track. 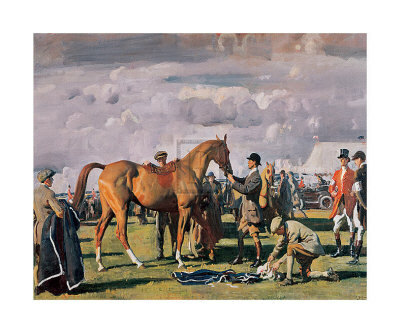 The painting at the top of this page, "The Red Prince Mare" is a classic and perhaps Munnings' best known painting. It certainly is a prime example of the beauty found in his work. If you find yourself impressed by his paintings you're certainly not alone. Several of his paintings have sold for millions of dollars, with "The Red Prince Mare" topping the list at over $7 million. This occurred many years after Munnings death yet Sir Alfred was no starving artist. In addition to his commissions which made him a wealthy man, Sir Afred was president of the Royal Academy of Art from 1944 until 1949.